6210: Radio Borderhunter @ 13.14. SINPO 33222. 6220: Mystery Radio @ 15.50. SINPO 55555. 7485: Free Radio Victoria (tent) [per UK DXer blog] @ 12.09. SINPO 44232. Strong noise here, audible however when using narrow filter. Signing off @ 13.01 UTC. 7610: Radio Amica @ 12.05. SINPO 34333. 12257,30: WR International (tent) @ 11.32. SINPO 35232. Heared for several minutes with quite good signal, soon faded out, but later faded in again. 6210: Borderhunter Radio @ 08.50. SINPO 44444. Playing "Una Paloma Blanca". 7610: Radio Amica @ 08.57. SINPO 34333. Lots of Italian language talk. 6220: Mystery Radio @ 23.05. SINPO 34333. 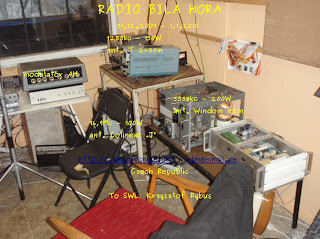 Bila Hora Radio QSL card for my report sent 31 Dec. 2009. Thanks a lot ! 6220: Mystery Radio (tent) @ 18.33. SINPO 44444.